RPS Ascension: Relearning Warfare (Summer, Year 1) | SPACE-BIFF! Akenbei is an imposing god. He stands fifteen feet tall, is gifted in earth and astral magic, and is a veritable battering ram of a warrior. He has marched north to the modestly wealthy independent state of Talito with a mind to expand his power. His army — more a band of ruffians at this point, but Akenbei reminds himself he is a patient god — is enthusiastic. How much trouble can the defensive forces of such a small state be, anyway? Unfortunately, Akenbei’s long slumber has left him drowsy in the tactics department. The battle kicks off poorly when Akenbei forgets to instruct his main core of bandit infantry to hold up while he casts Twist Fate to protect himself. Screaming their pretender’s praises, they rush forward with him thundering at their heels. Or so they believe. Right up to the point they crash into the line of Talito’s milita forces and are cut down in distressing numbers. Akenbei catches up and begins vetoing the enemy milita’s victory, but already his number of loyal bandits is thinned. This continues for a short time, but the enemy militia is killing the invading bandits faster than Akenbei’s fists can stop them. Eventually, the straggler remnants of Akenbei’s glorious army take flight, leaving Akenbei embarrassed and alone. Thankfully, whoever Talito’s general is, he isn’t much smarter than Akenbei, and his men pursue the fleeing bandits rather than surrounding and dragging down the cyclops pretender. With the enemy defenders divided, Akenbei is able to kill them one at a time without much threat to himself. It only takes one cyclopean punch per soldier. The battle is technically won and Talito pledges allegiance to Yomi, but it’s apparent that Akenbei is going to have to revisit his strategies. After all, warfare is very different now than it was back in his day. Back then, the local titans would set a time and place (usually the nearest fairy grove at twilight) and set to thrashing one another. Sigh, it was a simpler time. There was one hero who emerged from the battle for Talito: the bandit leader Raidon. He had the common sense to not follow along with the bandit-rush, instead staying back and managing the archers. Word of his tactical genius has already spread throughout Yomi, with the result that he can now command more troops and is so confident that his battle prowess has increased. Akenbei reminds himself that he is a jealous god, but not the kind of jealous that would throw Raidon into the Netherworld-fissures back in Yomi’s capital. 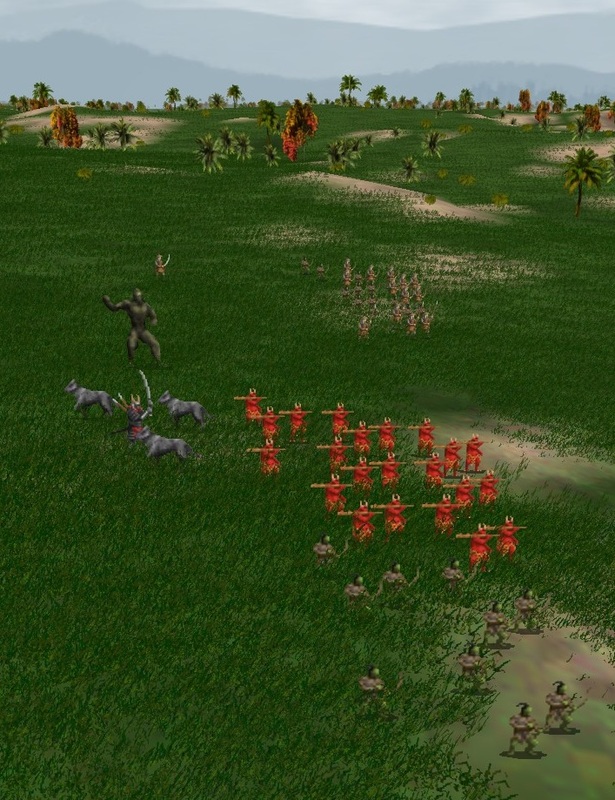 First: the infantry will wait for Akenbei to finish casting his defensive spells before charging. This is essential. Second: fewer bandits, more demons. 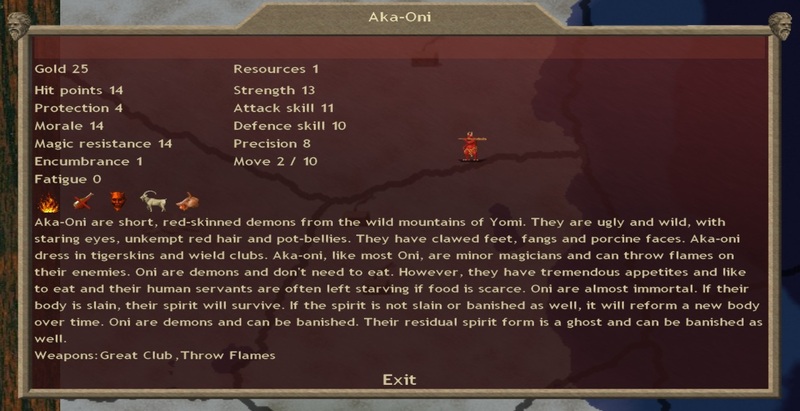 After a short time at Yomi, Akenbei and Raidon march their much-more-impressive army southwest to the province of Histyra, a nice little place governed by the Wolf Tribe. The Wolf Tribe is precisely as wimpy as they sound — perfect for a symbolic victory to restore morale. Ichiro, Akenbei’s prophet, begs to be permitted to come along, promising to bring his magic grey wolves, and Raidon persuades Akenbei that the wolves might be useful arrow fodder. The battle goes perfectly. 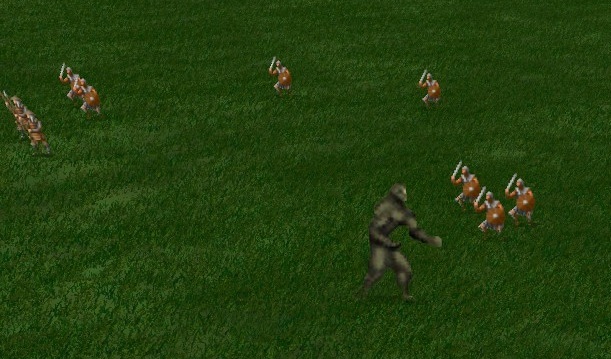 Arrows from the bandit archers and bakemono shred the unarmored warriors of the Wolf Tribe before they even reach the Aka-Oni. 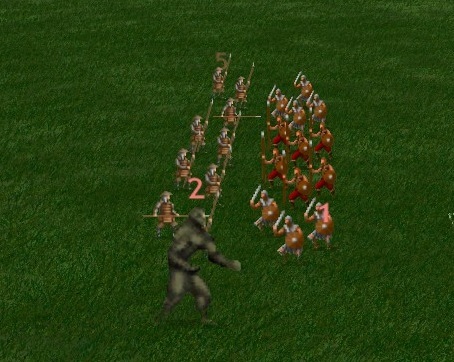 And then, when the Wolf Tribe’s own archers fire upon the Aka-Oni, they receive an awful surprise: Aka-Oni are immortal. When the body of an Aka-Oni is killed, his spirit becomes corporeal for a time, continuing the fight. If this spirit is not destroyed, his body will eventually reform. 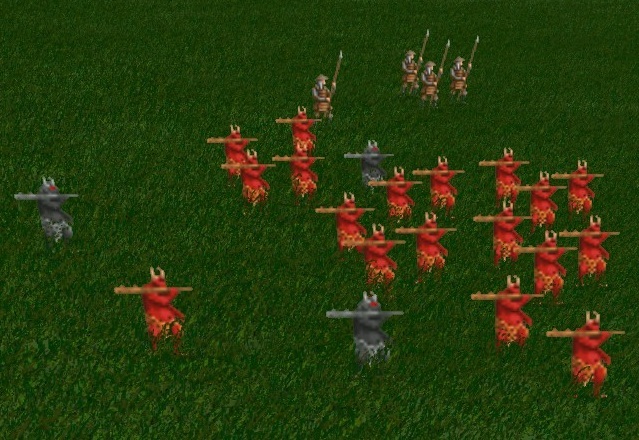 This does not bode well for the Wolf Tribe archers, who see that their arrows are not doing anything at all. After only a few volleys, they take flight. The Wolf Tribe pledges themselves to Akenbei and the Yomi, and Histyra is conquered. More importantly, Akenbei has rediscovered his confidence. The pretender’s identity is still unknown, but whoever it is he now leads the armies of Marverni, an alliance of tribes not unlike the Wolf Tribe, but led by powerful druids and now granted patronage from a would-be god. 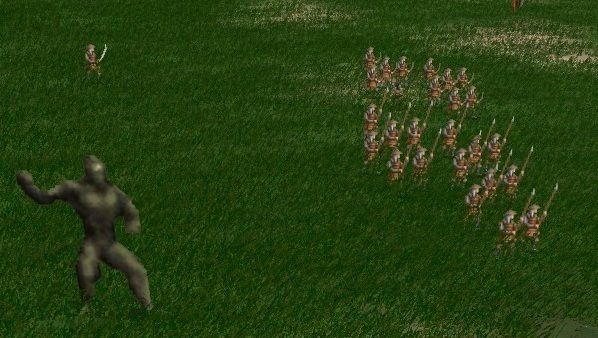 Allied — and with a demigod at their head — these tribes will be much more difficult to conquer. What this means for Akenbei and Yomi, we’ll find out in autumn. 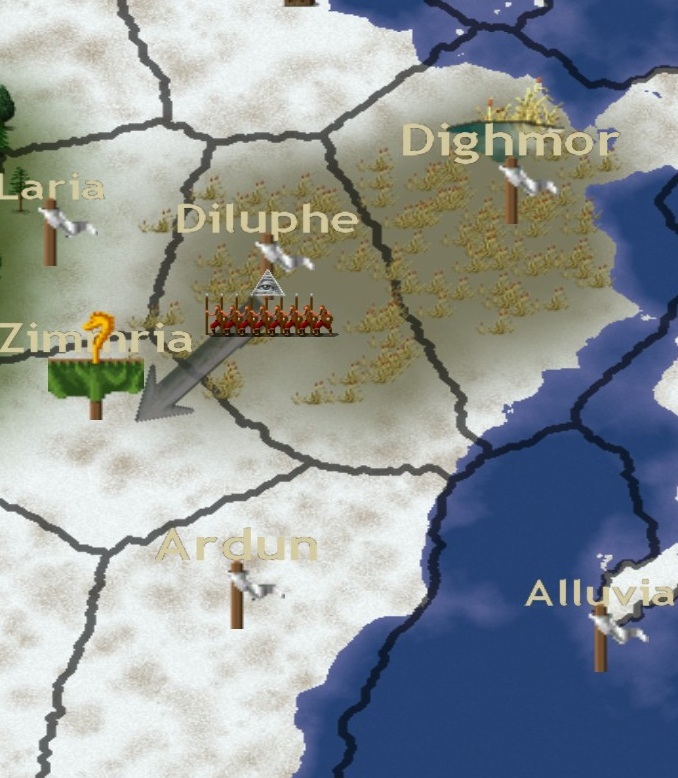 Posted on September 23, 2011, in Game Diary and tagged Dominions 3, RPS. Bookmark the permalink. 1 Comment. Pingback: RPS Ascension: The Index « SPACE-BIFF!